Hebrews is a book for people who are beat down, worn out, and considering giving up. Hebrews is a book for people who need encouragement to persevere in the hope of the gospel. 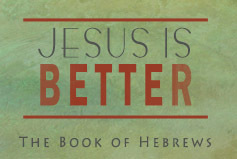 Hebrews is a book for people who need to be reminded that Jesus is better and more beautiful than anything this world has to offer.